The Countdown to the Return of Scandal has begun! We have less than 1 month to go before an all new Scandal returns to ABC. To help our Gladiators Cope Without Pope, we created the Scandal advent calendar, also known as the Scalendar. 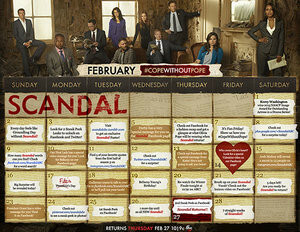 The Scalendar is a countdown calendar to Feb 27th unveiling a new piece of content each day until Scandal returns! There will be content actionable elements of the campaign for the entire month in which you can participate and help us to share. Please make sure to check Facebook daily for each piece of content.